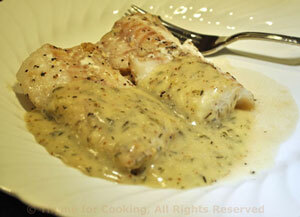 Cod with White Wine Mustard Sauce, quick, easy gourmet dinner. I used thick cod filets for the fish dish, (here called the back of the cod). If you use thinner filets, baking time is considerably less. Save the braising stock from the endive for the risotto. Any nice filet of white fish would be good: walleye, sole, catfish, cod, snapper, for this simple dish. The shallots are lightly sautéed and finished with a bit of wine, stock and tarragon. Drizzle lemon juice and 1 tsp olive oil over fish. Sprinkle with 1/2 tsp each thyme and tarragon. Heat remaining 2 tsp olive oil in a small saucepan. Add shallot and sauté until tender. Add stock, wine, mustard, remaining herbs and bring to a boil. Dissolve cornstarch in water and add to sauce, stirring until thickened. Remove from heat and keep warm until fish is done. The orzo is made like traditional pasta, cooked in a large volume of boiling water, drained and finished with a sauce - in this case, simple Browned Butter. 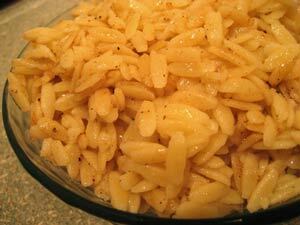 Cook orzo in a large pot of boiling water, the same as any other pasta. When done drain and toss with olive oil. Return pan to medium heat. Add butter and sauté until it turns golden brown, being careful not to let it turn too dark or it will taste burnt. Add the orzo and quickly stir with a spatula to coat and heat through. The braised endive is finished with a dash of white Balsamic vinegar, a bit of cheese and a sprinkle of olives. Rinse endive and remove 2 or 3 outer leaves as needed. Cut each endive in half the long way through the stem. Lay in a skillet large enough to hold them flat, in one layer. Add chicken stock, cover and simmer until the stem end is tender when pierced with a knife, about 15 minutes. Pit olives, if needed and roughly chop. Pour off all or most of the chicken stock. Sprinkle the vinegar over the endive; top with cheese and cover until cheese melts. 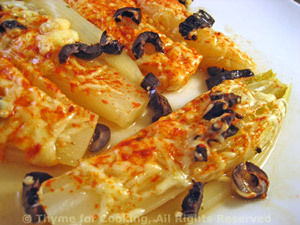 Remove Endive to a plate, top with olives, paprika, salt and serve.